The Outreach Department at HCPL provides a variety of services to residents outside the library, particularly those facing physical, economic, social, geographic or other barriers to accessing library services. The most recognizable part of the Outreach Department is Mobile Library Service (formerly Bookmobile). Outreach services include early literacy opportunities for children, delivering library materials and programs to residents in retirement communities, representing HCPL at community events, and fostering community partnerships. The Mobile Library Service is dedicated to bringing quality outreach to retirement communities, child care centers and is a popular sight at many area events. Bringing the library out of the buildings and into the community, Henrico County Public Library's first Bookmobile went into operation in 1977. The current model was purchased in 2012 with maximum flexibility, efficiency and accessibility in mind. The Mobile Library Service visits Henrico County senior living communities monthly, bringing 3-5 book carts of large type, current fiction and non-fiction titles, as well as magazines, DVDs and audio books. Our staff are dedicated to bringing high-interest materials and programming to local senior communities, encouraging interactivity, socialization, and an improved quality of life. Please have administrative staff for your community fill out the form below if you are interested in being added to our monthly schedule. Mobile Library Services brings library materials and services into a designated public area of your community. The designated area should be spacious enough for five (36" x 22") book carts allowing ample room for wheel chairs, walkers and motorized carts to move freely. Activities Director should arrange furniture prior to scheduled time of visit. Activities Director should be aware of scheduled time of visit and not double-book events. A current schedule will be provided to your facility. Activities Director or representative of the activities department must accompany residents and remain with the Mobile Library Service during our visit. Post the Mobile Library Service schedule and include in your monthly publications so that your residents will be aware of the date and time of our monthly visit. The facility should have enough room for a 29 foot van to maneuver, unload/load book carts, and park. We will be happy to issue independent residents a library card. Cards must be kept in good standing to ensure they continue to enjoy library service. A Corporate library card can be issued to your facility. For more information, please see MLS staff or call 501-1953. Card must be kept in good standing. 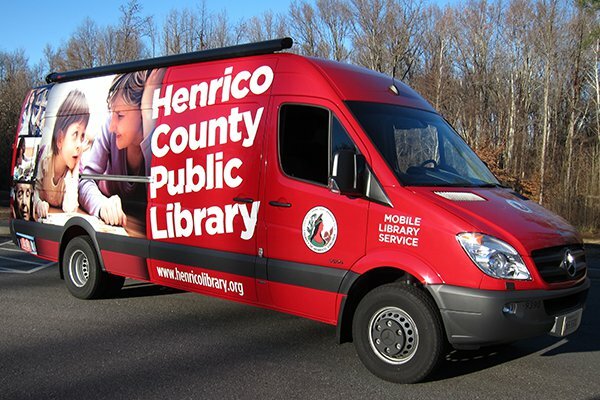 Mobile Library Service staff provide early literacy storytime visits to Henrico County child care centers, focusing on preschool-aged children. Combining books, songs, and movement, these storytimes encourage children and staff to engage with the stories and each other. Selected with the 2-5 year old preschooler in mind, our themes and activities are designed to spark a love of reading and support the building blocks of lifelong learning. If you are interested in the Mobile Library Service adding your child care center to our schedule, please fill out the form below and a staff member will contact you within 3 business days. Please post our scheduled visits for your teachers, so that your classes can make the most of the time we have to share with the children. Centers are expected to have their classes ready for their scheduled visits or else notify the Mobile Library Service by phone of any cancellations at least an hour in advance of the scheduled visit time. Teachers must accompany, and remain, with their classes during these special visits. You are our partners and you know your children best. Safety first! Participation is encouraged not only of the children, but the teachers as well! It is fun and it helps your students learn and stay focused. Thank you for joining us. Failure to adhere to these guidelines may result in termination of service. Children reading to a dog at Dorey Park. Staff member reading to children at Dorey Park. Mobile Library Service van at the Dorey Park Market. Staff member under HCPL's outreach tent at a Back to School event. When the time came to replace the previous Bookmobile, staff took the opportunity to re-evaluate the Mobile Library Service model as a whole. Statistics showed that the median age of Henrico County's senior population was increasing from the lower seventies to the eighties and staff observed that many in wheelchairs and walkers did not come out to visit due to the steep steps of the bus. Another factor restricting growth was the schedule — the Bookmobile operated on a bi-weekly rotation that offered little flexibility for adding new stops. The recession in 2009 and the resulting impact on the library's budget made clear the importance of a cost-effective vehicle. By choosing a less expensive, more efficient vehicle and changing the service model, staff were able to improve service and substantially cut operating costs. With the new vehicle being outfitted with a hydraulic lift, the Mobile Library Service brings four to six carts of materials into each facility they visit. Since starting this new lobby-stop style service to senior facilities in January 2013, circulation and new library card registrations have doubled. Staff have also developed early literacy storytime programs that are presented at area child care centers, with a focus on underserved populations. This Bookmobile was designed to emphasize its primary role as a facilitator of reading readiness for children and provider of materials focusing on current topics and popular titles for adults. A highlight of the vehicle's design was a children's area, which allowed for up to twenty-five preschoolers to come aboard and enjoy storytimes presented by the Bookmobile staff. Improved shelving enabled the Bookmobile to carry more books, magazines, and other materials than ever before. In addition, the staff workspace housed an electronically networked system of computers and telephones that kept the Bookmobile in direct contact with the Library's automated catalog and Internet presence. The Bookmobile's service initially targeted neighborhoods, but as the library system expanded, adding more branches, the Bookmobile's mission evolved and changed as well. With the addition of a larger vehicle, child care centers, nursing homes and subsidized housing became the focus of service. Community Outreach events were added to its schedule, including neighborhood festivals, mall activities and school visits. Staff worked hard to build a collection and develop programs that supported the Bookmobile's two-fold mission of reading readiness for children and recreational reading for adults and seniors. On June 6, 1977, Henrico County Public Library launched a new and exciting service that brought books and people together outside of the traditional bricks-and-mortar setting. The Bookmobile rolled out of the Fairfield Library parking lot and into the lives of thousands throughout the county, building community ties that endure to this day. "Gerty" as we affectionately call the Gerstenslager was originally painted yellow. In the early Eighties the vehicle was repainted white with a magenta and gold stripe and an eye catching design of book pages created by the library's graphic artist.